Several months ago, in Beijing, I met with current and incoming students, parents, alumni, and school counselors. The most remarkable thing about the trip was its surprising ordinariness. What I mean is that the students in Beijing were in many ways like Macalester students from anywhere. As expected, they showed a high level of interest in subjects like math, computer science, and economics—not unlike their American counterparts—but I spoke with an incoming student with a passion for philosophy, with another planning to major in environmental studies, and with a young dancer looking forward to performing in our new building. 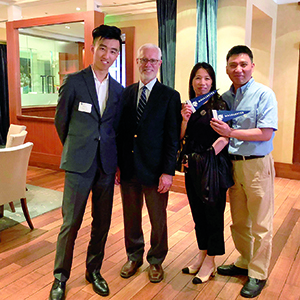 Yufan (Francis) Ma ’21 and his parents, Ying Cui and Shuquan Ma, with President Rosenberg in Beijing. The parents were parents: proud, protective, ambivalent about the prospect of their children leaving home. The alumni missed Mac, and the school counselors were focused on helping their students make sound college choices. Aside from the smog, traffic, and jet lag—and the invaluable services of my translator, Max Wang ’15—the events, at times, did not feel dramatically unlike ones I might do in Boston or Baltimore. (Yes, both the smog and the traffic are much worse in Beijing.) Differences in language, culture, and politics seemed less consequential than the priorities and passions we had in common. This is important because of what is happening right now in American higher education and more broadly in American society. Since the end of 2016, the number of international students coming to the United States to study has been steadily declining, reversing a long-term trend. The decline is not limited to students from a particular country or part of the world, but includes China, India, Germany, Mexico, South Korea, and most other countries that have traditionally sent students in meaningful numbers to attend undergraduate and graduate school in the United States. I should note, as an aside, that this trend extends to areas beyond education. While globally the growth in international tourism has been dramatic, the United States is an outlier and has actually seen a decline in the number of tourists from other countries. Make of that what you will. To date Macalester has been fortunate in avoiding any decline in applications or deposits from international students, though we cannot assume this will perpetually be the case. The number of international students on campus now is higher than at any other point in my presidency, and those students represent nearly 90 different countries. Our success in bucking the broader trend, I believe, is the result of our long history of international recruiting and our strong messaging about the welcoming culture at the college. Trips like my recent one to China, where I can meet personally with students and their families, are helpful. We talk often about the educational benefits of having students on our campus from all parts of the country and the world, from every background and culture, practicing every religion or no religion at all. Many studies have demonstrated the economic benefits of the best students from around the globe choosing the United States as an educational destination. To this I would add perhaps the most fundamental and important benefit of all: bringing people together from around the world reminds us of our shared humanity at a time when such a reminder is desperately necessary. We are, for complex reasons, living in a moment when fear of the “other” and anger at those who are not like “us”—by virtue of race or religion or citizenship or some other factor—are powerful and prevalent. Nothing good will come, nothing good has ever come, of these emotions or the ideologies they generate. Macalester offers an alternative model, one that stretches back at least into the middle of the past century, when President Charles Turck wrote that Macalester aspired to be an institution where people think and act “not in parochial terms, not even with a national bias, but in world terms.” Those words were published in The Mac Weekly on August 17, 1945, not long after the end of the most destructive and widespread war in human history. Five years later, the same man raised the United Nations flag in the center of campus, where it continues to fly today. Places like Macalester, with its emphasis on internationalism, multiculturalism, and service to society, are most important not when such a mission is universally embraced, but when it is not. Their essential moment is when their work is most challenging. We were in 1945 and we remain in 2018 an emphatic expression of faith in the potential of human beings to live with and learn from one another, regardless of their differences. We reject fear, we reject ignorance, and we reject the destructive forces they engender. At this moment, as much as at any moment in the past, Macalester is necessary. This column appeared in the Fall 2018 edition of Macalester Today.